Snorkelling is a great and safe way to explore fascinating underwater kingdoms and maybe even discover a new sub aqua passion beneath the waves. Snorkelling is the recreation of exploring the underwater life from its surface using a diving mask and a breathing tube. 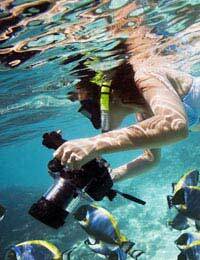 Popular snorkelling locations include such warm, coral-rich seas as the Caribbean, the Indian Ocean and the Red Sea. Although possible in any body of water, snorkelling typically takes place in calm and clear tropical waters, where there is interesting marine life to observe. As such it is a tranquil and fairly safe pursuit. Contrary to most watersports it derives its excitement from the slow and peaceful observation of marine life and not splashing at high speeds, and so attracts few dangers. Snorkellers usually avoid areas that have busy shipping, watersport and boating activity. A boat nevertheless can be an ideal base for a snorkelling trip, as it saves the need for swimming out from a shallow or busy beach. Popular diving locations will usually offer opportunities to take trips out to a high quality snorkelling spots. In most bays the most interesting areas for marine life are typically the rocky headlands found at the ends of a bay. The water is also often clearer at such spots. A snorkeller is able to observe the underwater world for extended periods of time and with minimal effort with the aid of swimfins for efficient water propulsion, a diving mask and the eponymous snorkel, a shaped tube used for breathing. A wetsuit is also usually worn in colder waters. The mask is a snorkeller’s most important piece of kit. If it fits correctly and comfortably then the experience underwater will be a happy one, an ill-fitting leaking mask, on the other hand, will make it miserable. It therefore worth that extra bit of time researching and choosing the perfect mask. When trying on a mask, make sure it sits below the hairline, otherwise it will leak, and snugly on the upper lip without constricting the nose. To test the mask has an all-round seal, fit the mask and breathe in through the nose, if it does it will stick firmly to the face. To enjoy it safely, snorkelling does not require any special training or great financial investment. All that beginners are expected to do is be able to swim and breathe through a snorkel. Nevertheless it is recommended novices receive some basic practical instruction on areas such as equipment usage, safety and what to look for underwater. Beginners can usually find such tuition at diving shops and centres or equipment rental places, which are easy to find in popular snorkelling spots. Those serious about their snorkelling beyond a holiday adventure can follow the British Sub Aqua Club’s (BSAC) training programmes, which are available a various BSAC-approved watersport centres across the UK. Don’t swim alone but with a companion or an expert guide or organised group. Snorkellers should adjust all mask and snorkel settings for comfort before heading out, as this is difficult to do once already in the water. Always beware of boats coming past as a collision with a vessel could prove life threatening. Make sure the driver can see you by waving. Rinse out ears with freshwater after every snorkel to minimise the risk of outer ear infections. Live coral is precious and fragile and although divers can touch it gently they must be careful not to be heavy-handed or heavy-footed, as it will easily break. Also it important not to tread water over the sand as this will stir up sediment and smother the coral. Caution is not only recommended for the coral’s preservation but for the diver’s too, as it can be very sharp, and make a nasty gash in a stray leg. All coral cuts should be washed thoroughly once out of the water, and treated several times per day with antiseptic cream to avoid infection. With similar care it is also safe to touch most other invertebrates and seaweeds - however divers should steer clear of anything that looks sharp or spiky. They should also avoid picking up shells – some such as the cone shell will respond with a poisonous sting – and putting their hands into small caves or holes.